I thought it might be usefull to implement this in a kaseya script to create reports based on the output. Fortunately the tool has an export to CSV option which makes things quite easy. - When the procedure is scheduled it prompts for parameters: esxhost, user and password. - When the procedure is executed it writes a zip file named Rvtools to the agent workdir\tools and extracts a folder with the same name. After this a file named csv2html_rvtools.bat gets written to workdir\tools\RVtools. - One of the extracted files rvtools.exe is executed with some switches and the parameters you typed in the popup. * If successful rvtools.exe writes a csv file for every configuration category (one per tab you would normally see in the GUI of RVtools). * When RVtools fails the process keeps running in the background. - procedure is paused for 45 seconds. - A check is made whether rvtools.exe is still running, if that's the case the script kills rvtools.exe and exits. - csv2html_rvtools.bat kicks in to convert the CSV files to a HTML report. * Which delim is used in the CSV seems to depend on the regional settings or some other settings on the agent, either way the delim can be different on each agent. in my environment on some agents the CSV is delimitted by ; and others use , . The script takes care of determining which is used and ignores delims within quoted text. Also the script puts space between double delims because the cmd for loop in the batch file that splits the CSV's otherwise misses columns. it's likely there are still some unforeseen issues in the CSV handling. - Once the CSV is converted to html it will be passed to an AgentProcExtension named Convert2PDF (A custom kaseya script function). - The kaseya server downloads the output to the agent documents "Document\vmware-esxinfo-<esxhost>.pdf"
Make sure that the number assigned to scriptId is the same as the one Convert2PDF procedure has after you imported it. 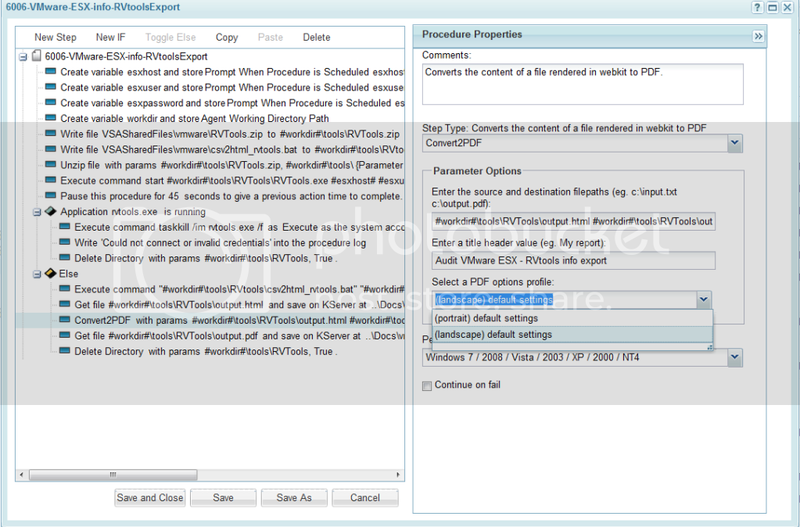 - Edit the variables in Convert2PDF for PDF layout customization (header, footer, spacing etc.) and the title in the convert2pdf step in the 6006-VMware-ESX-info-RVtoolsExport procedure. Also be aware that custom procextensions can be overwritten when kaseya adds new procextensions. Also a rather big security con I can't fix: The password you enter in the popup is not hidden under asterisks. I recommend using readonly accounts for this script. Please post feedback and share improvements. The problem is the file is no longer available to download. Hi Jelle, This tool looks great as well i don't know how i missed it but can you please repost the download. I haven't made any changes yet, due to lack of time. In a few cases the tables end up malformed because there are some issues with sanitizing the input in the CSV2HTML batch script. I think it needs to be rewritten in powershell or some other language to get this right. [edited by: jelle.stoel at 8:17 AM (GMT -8) on 1-19-2012] . This looks amazingly useful! Going to have a tinker this morning! Hmm, can't seem to import the 6006 procedure, no errors, it just doesn't seem to show up anywhere after import! 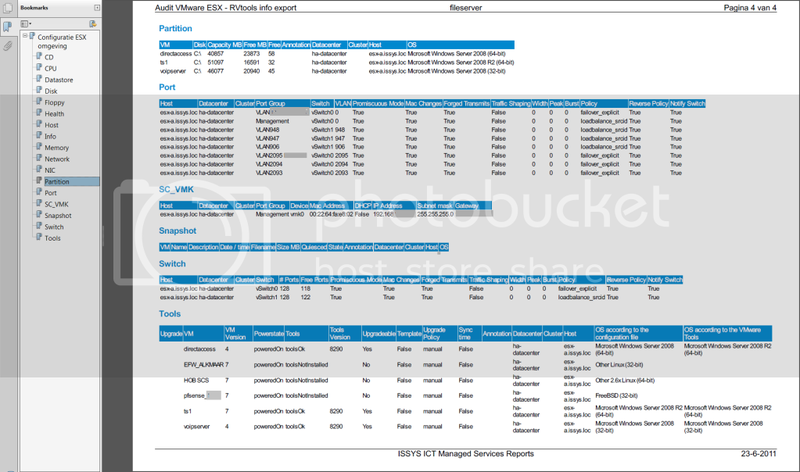 Error - The procedure '6006-VMWare-ESX-info-RVToolsExport' could not be imported. The given key was not present in the dictionary. Hopefully short term this will help get it up and running! I got it to import by doing all the server side steps first and then re-attemptign the import. @Bryan, you're right - In the end I had to do the same (remove fromt he script and add manually) otherwise it imported as a corrupt script. The procedure is failing for me on the 'then' at step 10. Curses. - Are there any other stages that others had to add to get theirs to work? Also have you tried running the steps manually? [edited by: jelle.stoel at 8:18 AM (GMT -8) on 1-19-2012] . I have been doing some testing and it seems to fail at the convert2pdf stage, therefore I think perhaps there's an issue with the agentprocextension (I placed the agentprocextension as number 49 as we had 1-48 already) or the Convert2PDF ScriptID.